According to the 2011 Erdos & Morgan Opinion Leaders Survey, a highly regarded study of media influence, GOVERNING Magazine is the 2nd most widely read print publication for state and local government leaders after USA Today and the # 3 most influential after The Wall Street Journal and The New York Times. The Erdos Survey also found that state and local leaders rank GOVERNING the # 1 most credible print publication and the # 2 most objective and most current publication after The Wall Street Journal and USA Today, respectively. In the 2012 Erdos & Morgan survey, governing.com was top rated - #1 - among state and local leaders in three categories - most visited (ahead of NCSL, Fox News, Politico, and CNN), most objective and most current. GOVERNING's readership also includes journalists, academics, advocates and activists, as well as representatives of companies that do business with state and local governments, a market that spends $3.2 trillion annually and employs 20 million people. GOVERNING has received numerous editorial awards and recognitions over the years, including four National Magazine Awards nominations, the Folio Editorial Excellence Award and in 2011, the prestigious Jesse H. Neal award from American Business Media for exceptional editorial content. Regional and national media look to GOVERNING for authoritative news and analysis. USA Today, NPR, Fortune, the New York Times, the Wall Street Journal, the Washington Post, 60 Minutes and Dateline NBC all have cited GOVERNING articles in their reports. In 2011 the GOVERNING Institute was established with the aim to advance better government by improving performance and outcomes through research, decision support and executive education. Based in Washington D.C., GOVERNING was for many years part of Congressional Quarterly. 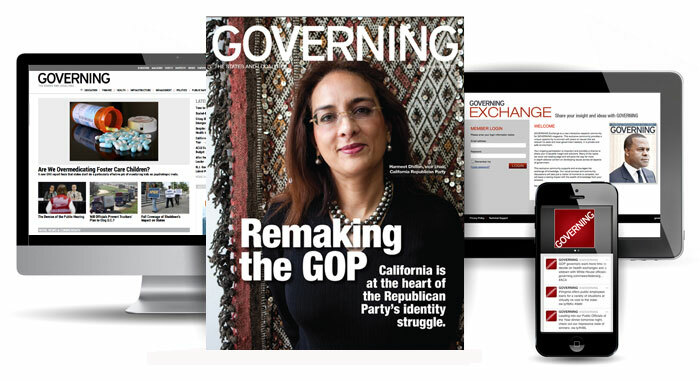 In 2009, GOVERNING was acquired by e.Republic, the nation’s only media and research company focused exclusively on public-sector innovation for state and local government and education. e.Republic is also home to Government Technology, Emergency Management and the Center for Digital Government. GOVERNING is a staff-written magazine and does not accept unsolicited submissions for publication. From time to time, the GOVERNING Institute will accept submitted material to appear in the Voices section of governing.com. Contact the Institute about Voices. If you see yourself as a leader, looking to grow in a dynamic work environment, then join us.